Peter "Durante" Thoman is the creator of PC downsampling tool GeDoSaTo and the modder behind Dark Soul's DSfix. He's previously analyzed the PC ports of Dark Souls II and Valkyria Chronicles for PC Gamer. Today, he's celebrating his favorite genre. I like to imagine that when historians of the medium of gaming look back on 2014, they will see it not as the year of half-baked “AAA” games, not as the time when microtransaction profits surged further ahead, but rather as the first year of the CRPG renaissance. Asking a fan of the CRPG genre—that is, old-school computer RPGs—about when it reached its peak, you’ll likely get a large range of answers, from the late 80s up until the turn of the century. What you won’t hear is any year from, say, 2004 to 2013. While the genre has not died entirely over the past decade, it was kept alive on a sparse diet of shoestring-budget indie titles, and the very rare larger highlight, such as 2007’s Mask of the Betrayer. All of this changed in 2014, and it’s not looking to stop any time soon. Even genre aficionados might have had trouble keeping up with the deluge of great games throughout the year—these are generally not short games—and it seems all but impossible for the casual fan. As such, I want to close out the year by providing a quick look at each of my personal highlights, and an even quicker overview of some other worthy candidates. In a year filled with amazing games in my favorite genre, it’s hard to select a single one to stand above the rest. However, if I had to choose, it would come down to Might & Magic X: Legacy. As a grid-based open-world turn-based first person party RPG, it’s a representative of what might be the rarest RPG subgenre of them all. Certainly, this is not a choice I’d have ever expected to make at the start of the year, but M&MX is the complete package. It combines rewarding exploration and dungeon crawling with great character development and combat systems, and had me glued to my screen throughout its entire duration. I am still amazed by the fact that this game was even made, and in the shape of a true old-school sequel and not an ill-advised attempt at “rebooting” the franchise. As you might be aware, Might and Magic is owned by Ubisoft these days, and, as the story goes, it is only due to the near super-human persistence and passion of some of their employees—and the success of 2012’s Legend of Grimrock—that the project ever got off the ground. I fervently hope it is not the last one. With Divinity: Original Sin, the fine folks at Larian Studios managed to fulfill their ambition of providing world interactivity on a level with Ultima 7, which has always felt a decade ahead of its time in that regard. But that’s not the whole story: in the process of doing so, they also created what might well be the best turn-based combat system in any RPG ever. I do not say this lightly, or merely to underscore just how good it is – having played a good chunk of them, I truly cannot think of any RPG which does turn-based combat better than Divinity: Original Sin. Its combination of a polished action point-based free movement system with highly meaningful and novel environmental interaction and a huge variety of spells and skills allows for almost limitless tactical possibilities. Even over the course of 70+ hours and a very combat-heavy final stretch, this ensured that the encounters never got old or repetitive. On top of these achievements, Larian have also proven (again, really, after all most of the Infinity Engine games did the same) that it is possible to create an uncompromising, deep, old-school RPG experience while including full campaign coop, a lesson I hope many other developers will take to heart. Larian themselves are already planning two new RPGs based on their engine, and I can’t wait to see what they come up with. Out of the games I’ve chosen to highlight, Dragonfall might be the most story- and character-driven. It is set in the Shadowrun universe, a veritable smorgasbord of science fiction, fantasy and cyberpunk, and a personal favorite of mine. While Dragonfall was originally released only as an expansion to last years’ Shadowrun Returns, developer Harebrained Schemes realized its full potential with a stand-alone “Director’s Cut” version. This second campaign improves upon its predecessor in many ways, both technically as well as in gameplay design. Saving works more like you would expect in a PC RPG, and throughout the campaign there is a lot more choice in what missions to undertake and their order. Skill checks in dialogue and quests also seem more evenly distributed than in the earlier game, which makes a larger variety of character build choices viable. Finally, your core party is now made up of true companion characters rather than faceless hirelings. And crucially, the developers still manage to nail the mood of the setting. Very recently, there have been some rumblings about a Kickstarter for a third Shadowrun campaign, and if they pan out I’ll make sure to be among the first to sign up for it. The first big crowd-funded RPG success, Wasteland 2 took a lot longer than expected to reach its full release, and had some significant polish and enhancement performed even beyond that. But the wait was worth it: inXile delivered a huge, sprawling post-apocalyptic RPG with a wealth of unique locations meshing into its central story, old school party creation and a large selection of character skills. While some interface niggles remain—the relative utility of skills may be somewhat imbalanced and no single element reaches the heights of Divinity’s combat system or M&MX’s exploration—on the whole Wasteland 2 is much greater than the sum of its parts. As a result, it is perhaps the closest of all the games I’ve chosen to highlight to delivering the complete isometric RPG experience which fans have been clamoring for. One thing is for sure: it comes as a huge relief to me, and probably many RPG fans, that inXile proved their skill to some extent with Wasteland 2. Their next task is, after all, to create Torment: Tides of Numenera, a spiritual sequel to one of the genre’s all-time greats, Planescape: Torment. It feels unjust to cut off the more detailed look at individual games and developers at this point, but sadly time and space are limited. 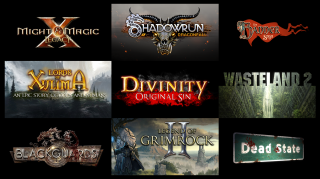 In any other year over the past decade, each of these games would have caused a splash in the RPG community, so relegating them to this part of the article is merely a concession to the massive quantity and quality of this year’s releases. Each of them is absolutely worth checking out, and all of them have something unique to offer. Blackguards’ hex-based strategy and faithful adaption of the pen-and-paper Dark Eye ruleset are absolutely worth a closer look. And the same applies to the sublime blend of exploration, dungeon crawling, and puzzle solving which can be experienced in Legend of Grimrock 2. Dead State presents a unique RPG experience and simulation of survivor behavior in a zombie apocalypse scenario, and Lords of Xulima combines isometric exploration with a first person battle system in an interesting reversal of the celebrated Realms of Arkania series. An interesting note about this renaissance of the CRPG sub-genre is that, despite the huge number of games, it seems to have left other releases in the broader sphere of RPGs mostly unaffected. This might be at least partially explained by the fact that many of these games were made by new companies, or separate teams in established development houses. Be that as it may, the point is that there have also been a great many action RPGs released in 2014, and some of them of surprisingly high quality. This of course includes games such as From Software’s Dark Souls 2, a great sequel to one of the best action RPGs of all time, and solid new entries in established franchises like Risen 3. However, there were also some jewels created by smaller teams, such as the dialogue-heavy Consortium which explores the idea of an RPG taking place in a minimal environment. And to top it all off, the new trend of Japanese ports exposed PC-only gamers to some true classics of the genre for the first time this year, with the obvious headliner being Valkyria Chronicles. Oh, and there was also a great new console-style RPG released on PC in the form of Obsidian’s South Park: The Stick of Truth. If there were no upcoming CRPGs at all, or if, after 2014, we’d revert back to the sporadic release schedule of the past decade, we wouldn’t have a renaissance on our hands. 2014 would be an aberration, a glorious one for sure, but still only temporary. However, that isn’t the case. While it still seems doubtful that 2015 will deliver the same quantity and quality of RPG releases that we saw in 2014, that is an impossibly high standard to set. Indeed, it is easy to argue that even during the golden age of the genre, the number of quality releases per year couldn’t quite match what we have experienced over the past 12 months. That said, 2015 looks like it will put up a fight nonetheless. There are, of course, the heavy hitters: Pillars of Eternity and Torment: Tides of Numenera—though the latter might not quite make it by the end of the year. They are supported by a scaffolding of promising independent games like Serpent in the Staglands, Underrail, and of course the grandfather among them, Age of Decadence. And some of this year’s games will see sequels in 2015 already, including Blackguards and The Banner Saga. I am almost at the point where I would appreciate the releases slowing down a bit so I have more time to catch up.